You wonder how anyone could read former Colorado Senator Hank Brown’s recent comments to Republicans, that a federal candidate’s position on abortion really doesn’t matter, and not think of failed Colorado Senate candidate Ken Buck, Rep. Cory Gardner, and others who made similar statements, even though a quick Google search shows just how incredibly important abortion issues are in politics at the federal level. Noting that he suspected most of the Republicans in the room disagreed with him about that — and adding that “Colorado, as you know, is the second-most pro-choice in the nation” — he argued that the [abortion] issue shouldn’t take center stage in elections because it’s out of the hands of politicians in Washington and just divides voters. “The reality is, that’s a constitutional interpretation. The people you elect on that issue don’t have anything to do with that. You don’t vote on allowing or not allowing abortion in the U.S. Senate or the U.S. Congress. It’s never even an issue,” he said, adding that most Republicans agree the federal government shouldn’t subsidize abortions. “So for Republican candidates, there isn’t any aspect of that pro-life, pro-choice issue that ever results in a vote in Congress,” he said, noting that in rare cases Senators can weigh in on the fitness of Supreme Court nominees and influence longer-term policy on abortion. Thank goodness reporters in Colorado didn’t let Ken Buck get away with it when he said essentially the same thing last year. Here’s a fine example of a reporter holding Buck’s feet to the fire in one televised debate, if you want to take a trip down memory lane. That’s just one case of Colorado journalists doing their jobs and mapping out the steps of the abortion buckpedal for citizens. The Ft. Collins Coloradoan didn’t let Gardner forget his stances on abortion either. If you look at what happens in Congress, you can see that reporters are obviously right that these issues are not just abstract theoretical distractions, like Hank Brown would have you believe. They make a big difference in politics as practiced in the Beltway, where you can’t predict what votes will be taken for what reason and when. Remember that Obamacare almost fell apart over abortion wedge issues, with Democrats and Republicans falling on both sides. And in March, abortion issues, including a dispute over funding for Planned Parenthood, nearly shut down the federal government, as negotiations stalled, with Gardner and Tipton among those digging in their feet on abortion. Also on the disputed chopping block were federal funds for international organizations that provide women’s health care in the world’s most impoverished countries, where the absence of these services translates into hundreds of thousands of deaths each year. Maybe some people don’t want to take it seriously that the national GOP platform calls not only for an anti-abortion amendment to the U.S. Constitution, but also for legislation changing the definition of a person under the 14th Amendment to include fertilized eggs, or zygotes. But how can you not take this seriously, given the strange unpredictability of abortion politics and that the GOP has a shot at controlling both houses of Congress and the White House in about a year? Herman Cain, Newt Gingrich, Cory Gardner, Mike Coffman, Doug Lamborn, Scott Tipton, or any other federal candidate, can’t say they favor personhood and then expect it to mean nothing to reporters. Sorry. Reporters know that one of their most basic functions is to air out issues so citizens can understand where the candidates stand and what they’ll do if elected. And so, Hank Brown, with due respect, journalists were right in 2010 not to accept the GOP post-primary cries that abortion issues mattered so little compared to jobs that they need not be discussed. And they should continue to matter a lot to journalists today and every day. You learn lots of little things when you listen to talk radio, and many of them you could do without knowing, like lawyer Dan Caplis’ assessment of Tim Tebow’s football skills. But other small stuff catches your attention, like the fact that Colorado Attorney General John Suthers wants everyone to have health insurance. You might think Suthers is the last person in Colorado who wants universal coverage, given that he’s pushing a lawsuit to stop Obamacare. SUTHERS: The founders never envisioned the federal government would be in the healthcare business. The individual mandate requiring every individual to buy insurance is premised, Congress said, on their Commerce Power, their power to regulate commerce among several states. In fact, the Commerce Power has been broadly construed to allow Congress to essentially regulate any economic activity that impacts interstate commerce. But therein lies the rub: this would be the first time in history that Congress will be reaching out to every individual American and saying we are going to punish you for your economic inactivity. For not engaging in commerce because your failure to do so impacts the marketplace by imposing burdens on other people who do buy insurance. KELLEY: But aren’t they assuming [Obamacare] is for our own good though? Really, the betterment of everyone. So, how do we get everyone covered, like Suthers wants? Why Steve Kelley didn’t ask him is beyond me, because it’s the most basic follow up question you can think of for anyone who trashes Obamacare in one breath and says they want the 44 million uninsured Americans to have health insurance in the next. Now back to the little things you learn on talk radio. SUTHERS: The state can exercise any power that the citizens don’t deprive them of in the Constitution. So unless you put a provision in the state constitution saying the state couldn’t force you to buy auto insurance or health insurance…that was one that we just voted on that in November, that’s what that was all about. Then the state can force you to do that. You might wonder if I was mistakengly quoting Mitt Romney not John Suthers, because he’s been saying Romneycare is well and good for Massachusetts, but Obamacare is sick and bad for America. And if you’re thinking that Suthers must have been talking to Romney, you might be right, because Suthers backed Romney in 2008 and remains on the Romney train to this day. Suthers didn’t endorse Romneycare, as far as I know, but he seems open to it, and it’s a question Kelley should keep in mind for next time. UPDATE 8-7-2012: This blog post was corrected to reflect the fact, incorrectly reported previously, that Rep. Scott Tipton is not on record supporting the personhood amendment in 2010. The Colorado Statesman went where no other media outlet dared go last week and asked Colorado’s congressional delegation whether they support the personhood initiative, born again last week at a Denver press conference. One could argue that the 2012 personhood initiative isn’t actually “born,” or alive in any way, really, until it makes the ballot, but for our purposes, a personhood amendment is considered alive when the proposed wording of the personhood petition has been officially submitted, and this occurred last week. Colorado’s Republican congressional delegation was mostly silent on the measure this week. U.S. Rep. Doug Lamborn is “a supporter of personhood,” according to an email sent by his spokeswoman, but press aides for U.S. Reps. Cory Gardner and Scott Tipton didn’t respond to inquiries from The Statesman and a spokesman for U.S. Rep. Mike Coffman said his boss was out of the country and unavailable for comment. The Statesman failed to note that Coffman and Gardner are former supporters of Colorado’s 2010 personhood initiative, and former Colorado Personhood poster child, now grown up, Kristi Brown, said Gardner was, in fact, “one of our main supporters” in Colorado in 2008. Nor did the Statesman report that, despite endorsing personhood in Colorado and Coffman have yet to endorse bills in Congress, backed by GOP lawmakers, aimed at making personhood the law of the land. Lamborn hasn’t endorsed federal personhood bills either, despite telling the Statesman last week that he supports personhood. Also, the Statesman briefly told the strange tale of failed Colorado Senate candidate Ken Buck’s relationship with personhood, consumated with a full endorsement of the measure. But Buck later admitted to having prematurely endorsed personhood, without understanding it fully, so he un-endorsed it. Still, Buck didn’t shed his personhood-like position on abortion, and it is widely believed to have played a key, if not decisive, factor in his loss to Sen. Michael Bennet. I’m a blogger, so I’m in a good unbiased position to write that bloggers make more contributions to the public debate than they are often given credit for. No matter where you are on the political spectrum, you have to appreciate the blogger who posts unedited video of public events, like Free Colorado’s Ari Armstrong did yesterday. 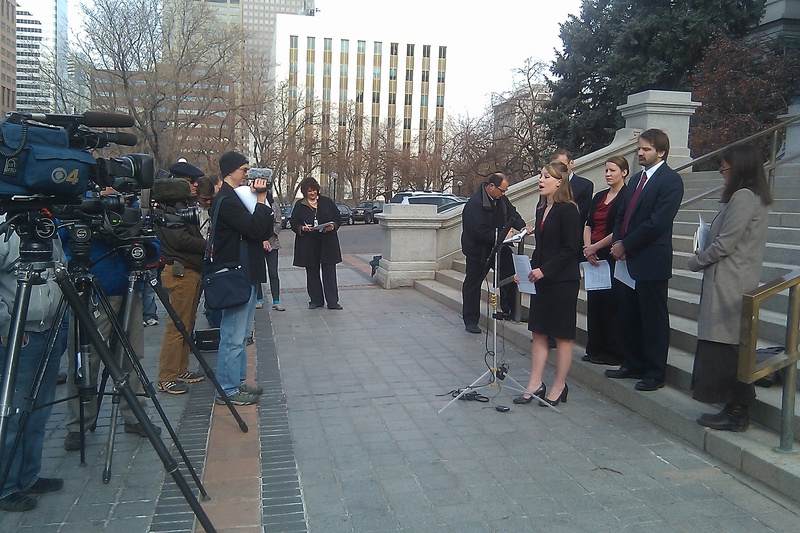 Armstrong posted video of a press conference staged by backers of Colorado’s personhood on the occasion of submission of wording for a 2012 personhood amendment. It’s excellent material, airing out good information, along with Armstrong’s interviews and written analysis, about the initiative. Skip this if you’re one of those people who won’t read blog posts about the latest outrageous comments on right-wing talk radio, because they’re just the latest outrageous comments on right-wing talk radio. But read on if you want a window into what hate looks like, and you want to call it out. You may remember my post in October about KENN radio host Sean Jeremy Osborn’s suggestion that the entire population of Iran is like a cancer and should be killed. Now Osborn is angry at Democratic strategist Donna Brazile. My guess is that Osborne has some underlying issues here, because you’d never think Brazile’s comment about the meaning of vegetables on pizza would set off a explosion of rage from Osborne. You can speculate for yourself about what’s really bothering Osborn after I explain what happened. Osborn played this exchange on his “Painful Truth” radio show and started screaming. There’s more, and you can listen to below. Osborn starts off by saying that the exchange reflects hypocrisy in journalism. hmmm? You’re thinking, who cares what an apparent right-wing nut says on a small radio station in the four corners area. I do because, hey, KENN may be small, but it still reaches the good people in multiple cities like Durango and Cortez. It’s also owned by American General Media, which appears to have at least one other station in California. So Osborn, who hasn’t returned past emails, because, he says I’ll take his comments out of context, as if this were possible, should explain his behavior to his bosses and the people of these communities. Contact KENN here. UPDATE: This blog post was corrected on 8-7-2-12. Scott Tipton did not support the personhood measure in 2010, as previously reported here. Another attempt at passing a personhood amendment, defining zygotes as people, would almost certainly fail if it makes the Colorado ballot next year, given that it’s gone down decisively twice in a row. So journalists covering the announcement today by personhood backers that they are petitioning to put the measure on the ballot shouldn’t get bogged down in the old questions of which forms of the Pill this amendment would ban. It’s well-known to Coloradans that common forms of birth control would be banned. The focus for reporters should be the politics of having a personhood measure on the ballot in 2012, in a swing state like Colorado. So I attended today’s news conference announcing the personhood petition drive to make sure these issues were raised by reporters, and since they were not, I filled in the journalistic gap. I asked Kristi Brown, who’s changed her name from Kristi Burton since she sponsored the first personhood amendment with her father in 2008, if she expected to get the same support from major candidates that her measure had gotten previously. I mean, you can argue that without a Republican primary, GOP candidates like Mike Coffman and Cory Gardner might not endorse the 2012 measure, given its apparent unpopularity with voters, especially women. “I haven’t personally talked to [Coffman and Gardner],” Brown told me. When she says a main supporter what does she mean? Here’s Gardner at one personhood event. I asked Gualberto GarciaJones, who wrote this year’s amendment, which has more expansive and precise language than last year’s, if he thought presidential candidate Mitt Romney would support his amendment this time, given that he’s changed his position over the years. Garcia Jones said Romney is known as a flip flopper and that his group would persevere regardless of the positions of Democratic or Republican politicians. (No major Democrats support the effort, as far as I know, but Michele Bachman, Herman Cain, and Newt Gingrich back personhood, and it’s endorsed in a plank of the national GOP platform. “I think it’s real possible we could get some strong Republican support,” but he said he hadn’t been in touch with Tipton or Gardner. Secretary of State Scott Gessler said a lot of interesting things during his speech at Colorado Christian University last week, but reporters should circle back and ask about a story Gessler told about the last legislative session. We know that Gessler made a lot of references to voter fraud during the last session, implying that there could be thousands of illegal voters. At one point, he said he that he did “believe” there were instances of fraud in Colorado that a photo-identification pill would have prevented. But during his speech Monday, Gessler said he had made a promis to show proof of fraud. Gessler said he was making a presentation to the Senate State Affairs Committee, and one Senator told him he’d agree with Gessler on a photo-identification bill if there were evidence vote fraud in Colorado. Gessler said he responded to the senator by promising to produce evidence of such fraud. “Well, you know, we’re going to provide some evidence of that,” Gessler recalled that he told the senator. The senator responded by saying the evidence would have to be “widespread,” Gessler recounted. Gessler doesn’t have “high hopes” that a photo-identification bill will get through the State Senate next session, but he plans to try anyway, he said. So this gives journalists a clue about where Gessler may be going with his accusations of voter fraud. With no proof of election fraud here in Colorado, he may trot out evidence, sparse as it may be, from other states, and claim it applies here. If he does this, journalists should report that Gessler promised to provide evidence of Colorado fraud. But reporters should point out that, in fact, when it comes to elections in Colorado, there’s essentially no evil to see or hear, despite much searching. The problem comes when you have a secretary of state who takes a promise-evil, see-evil, and hear-evil approach, and delivers nothing. As Mississippi debated then defeated a “personhood” amendment that would have granted legal rights to fertilized human eggs, multiple media outlets reported that GOP presidential contender Mitt Romney refused to clarify whether he supported the measure, which would ban not only abortions but also common forms of birth control. But no media outlet that I could find reported that four years ago Romney said he supported the federal equivalent of the Mississippi personhood measure. And if you’re Mitt Romney, and you aren’t shy about your position that life begins at conception, then your support of legislation granting legal rights to the “unborn” is an endorsement of personhood at the national level. “You know, I do support the Republican platform, and I support that being part of the Republican platform, and I’m pro-life,” Romney told ABC. So, for almost 4 years, you had to assume Romney supported federal personhood. But things changed in September of this year, at a GOP presidential forum in South Carolina. When Princeton Professor Robert George asked Romney specifically about the federal personhood measure, Romney flipped, saying he’d oppose it. Section Five of the 14th Amendment expressly authorizes the Congress by appropriate legislation to enforce the guarantees of due process and equal protection contained in the amendment’s first section. Now, as someone who believes in the inherent and equal dignity of all members of the human family including the child in the womb, would you as president propose to Congress appropriate legislation pursuant to the 14th Amendment to protect human life in all stages and conditions? That would create obviously a constitutional crisis. Could that happen in this country? Could there be circumstances where that might occur? I think it’s reasonable that something of that nature might happen someday. That’s not something I would precipitate. Two months later, in October, Romney told Fox News’ Mike Huckabee that he “absolutely” would have signed an amendment to the Massachussets constitution establishing that life begins a conception. Journalists (from The New York Times, The New Yorker, and others) tried to get Romney to clarify whether his response to Huckabee meant that he supported Mississippi’s personhood amendment, but his campaign did not issue a clear statement. Gitcho’s statement to Politico above, and her additional comments that Romney is “supportive of efforts to ensure recognition that life begins at conception” and that “these matters should be left up to states to decide,” leaves open the possibility for support of a Mississippi-style personhood amendment. In fact, that would be consistent with support for “efforts to ensure recognition that life begins at conception,” wouldn’t it? Similarly, Romney’s own statement last month to a voter in Iowa, who asked if he wants to ban birth control, sheds no light on his view of the personhood issue: “I don’t,” Romney replied. “I’m sorry, life begins at conception; birth control prevents conception.” This is meaningless because, as you know if you follow the complexities of this issue, personhood supporters don’t oppose “birth control,” like condoms that don’t wipe out fertilized eggs. And they don’t use the term “birth control” for IUDs and some forms of the pill that do destroy fertilized eggs, or have the potential to do so. Those are called abortifacients. So Romney’s statement that birth control prevents conception is perfectly acceptable to the personhood crowd, and he used the same logic to veto a bill allowing the use of the morning-after pill in Massachusetts in 2005. Romney’s changing position on the personhood issue, which may reflect his campaign’s concerns about polling on the issue as well as the experience of failed GOP Colorado Senate Candidate Ken Buck, has frustrated the folks at Personhood USA, which has backed state-based initiatives like the one in Mississippi. A federal personhood amendment is our ultimate goal, but it really depends on the language. If it protects every human being , no matter of stage of development, size, location, gender or race, then we would support it. In fact that is what we are hoping for. What if someone like Romney believes “life begins at conception” and also supports 14th Amendment protection of the “unborn?” Does that combination do the trick for Mason? “I believe so,” she replied. Like Personhood USA, Planned Parenthood also views changes to the 14th Amendment as the federal approach to personhood. Instead, the most fair and accurate way for journalists to describe Romney’s position on personhood is to write that he’s flip flopped on the issue over the years, first for personhood on the federal level (in 2007), then against it (in Sept. 2011), and finally maybe in favor a state version (last month). Colorado Secretary of State Scott Gessler said last month that he thinks “a lot of the mainstream media” get upset when Republicans “make waves,” but these hostile feelings toward the media didn’t stop him Monday from suggesting people can influence newspaper editors by writing letters to the editor and online comments. Gessler’s comments came in response to a question from the audience at his lecture Monday evening at Colorado Christian University’s Centennial Institute. The unidentified questioner asked speakers Gessler and Colorado State Treasurer Walker Stapleton what ordinary citizens can do. In addition to influencing journalists, by writing letters-to-the-editor and blogging, Gessler suggested people volunteer as election judges, sign up to receive e-mails from his office, and attend rulemaking hearings or submit comments on proposed rules. Gessler said testifying during the rulemaking process is important but did not have an impact in the recent challenge of his rule to increase the amount of money a group of people can raise for an political issue before their group is subject to campaign finance laws. “Now, this particular court [in the issue-committee-threshold case] didn’t read any of that [citizen testimony], so he [the judge] wasn’t quite prepared, which he admitted, which is unfortunate, but I’m sure the Court of Appeals will be far more prepared than he was, and those comments are just critical for helping me out,” said Gessler. Look, if you can spend time, two or three hours, once every two months, to write a letter-to-the editor, that makes a difference. Writing a letter-to-the-editor once every two months really makes a difference. It only takes three or four hours, about as much time as you’ll spend driving here, listening, and driving home. That makes a difference. It doesn’t just have to be The Denver Post. ; particularly local papers as well helps. When you see something in a local paper online, I’m assuming most people go online., instead of merely raging at the machine, I love raging at the machine, don’t get me wrong, instead of merely raging at the machine, write a post to that story. Because let me tell you something, newspaper editors pay attention to that stuff. And actually a lot of readers pay attention to that stuff too. When they write a story and they see a large number of comments one way or the other, that means something. We do a terrible job on our ideological side of the fence. We do a terrible job of this. I’ll go online, and my wife is watching, and she’ll say, ‘Don’t read those. Don’t read ‘em.’ And I’ll read them nonetheless. And look, people on our side don’t take the time to do that. You don’t have to put your name. You can be anonymous. You have sign up and register with your real name, but it can be absolutely anonymous. I would challenge everyone to do this, 20 minutes, once a week. That’s what I would challenge you to do for 20 minutes, maybe 30 minutes once a week. The other thing is, come to my website…and sign up for our e-newsletters…. So my office engages in rulemaking a lot. I just said, I’m re-doing all the campaign finance rules to make them clear. Okay. What helps me a lot, is when you come in to my office during rulemaking. You can come in person, is the best and testify. You can write us an email and that becomes part of our record. You can write us a regular letter and that becomes part of our record. The reason this is so important is, if I say, for example, I want to raise the threshold, and I did this. I held a rulemaking hearing, saying I want to raise the threshold to $5,000. Well, what happened is people came in, and I see Matt Arnold with his hand up the entire time, and he’s one of the people who came in. I’m teasing Matt. And he said look, and other people did, this is why it’s so hard, this is the burden we face. And when I get that evidence and testimony, and I can take that evidence and testimony and use it in court to defend myself. So if you can bring your personal experiences in, that’s just so critical. Now, this particular court didn’t read any of that, so he wasn’t quite prepared, which he admitted, which is unfortunate, but I’m sure the Court of Appeals will be far more prepared than he was, and those comments are just critical for helping me out. So, sign up for our e-newsletters, sign up for our notifications, write an email, write an email to us so you know what’s going on. Come to our rulemaking hearings. Once every two months, write a letter-to-the-editor. Twenty minutes a week, do a blog. I won’t ask anyone to contribute money to a campaign. And serve as an election judge. Those are the things you can do. And let me tell you. If everyone in this room did those things on a consistent basis, it would make a huge impact here in the state of Colorado. It would have an impact people rarely ever see. Just the people in this room, if everyone did that on a consistent basis. If Secretary of State Scott Gessler loses a lawsuit claiming he overstepped his legal authority by increasing the amount of money a group of people can raise before being subject to state campaign finace regulations, he will appeal the case, Gessler said Monday during a lecture at Colorado Christian University’s Centennial Institute. No decision has been handed down yet by a state court in the case, but Gessler told the audience last night that he “does not expect [the judge’s] opinion to be positive,” and if he loses the case, he will appeal. GESSLER: The question is, since I have got two different court opinions on the issue committee threshold issue, how am I going to resolve that? Here is what is going to happen. We don’t have an opinion from the Denver District Court. The court just decided he wanted to say nasty things about me in the newspaper. Frankly, I have never in ten years of litigation on very controversial issues, never seen a judge behave that way in the entire state of Colorado. I was very surprised by his comments and I did not support those…. UNIDENTIFIED AUDIENCE MEMBER: What is his name and when is he up for retention? GESSLER: He is up for retention in a year. Anyway, so I don’t have an opinion from him yet. I don’t expect that opinion to be positive based on his comments. So this I think is what is going to happen. First of all, we are going to appeal it. And I do believe that we will be able to point out, assuming the court comes out against us, the error of the courts ways. The second thing is, and I am pretty confident about this, is if we lose, the State of Colorado is going to be sued yet again on this issue. And again. Frankly, I fully expect that we will lose on this issue. And the claims board will have the opportunity to pay attorney fees yet again on this issue. It is an unfortunate state of affairs. I am hopeful I can prevail on this, to provide guidance on this upcoming election. But if I don’t, I have no doubt that the federal circuit court will step in and provide guidance here for the state of Colorado. You are currently browsing the The Big Media Blog weblog archives for November, 2011.